CLIP-ON EARRINGS Conversion-We Permanently Change or Convert by Mail! 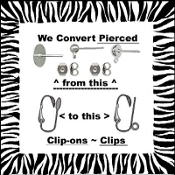 Team-Zebra Funky Jewelry >> CLIP-ON EARRINGS Conversion-We Permanently Change or Convert 4u! CLIP-ON EARRINGS Conversion-We Permanently Change or Convert 4u!